A heroic action RPG and the fifth main installment in the popular The Elder Scrolls franchise. Bethesda Softworks once again takes the players to the fantasy continent of Tamriel. 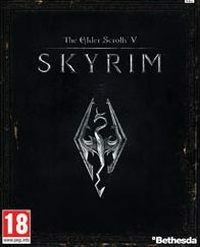 The Elder Scrolls V: Skyrim is the next part of the role-playing game series created by Bethesda Softworks Studios. You get to re-visit the continent of Tamriel, and this time the game’s story revolves around the return of the ancient race of dragons to the land. The action takes place 200 years after the events from Oblivion. Players take on the role of one of the last Dovahkiin, known as dragon hunters. Until recently it seemed that the mighty monsters belong to the past, but one day the scaled beasts again appear in the sky, and the prophecy foretells the arrival of Alduin, the god of destruction, who takes the form of a dragon. Fighting with the dangerous monsters you take their souls and abilities, so-called Shouts. These can be used to slow down time, repel enemies with invisible energy blasts, and even summon an allied dragon. Many of these skills are obtained once you find ancient words hidden in Nordic dungeons. The game starts with creating your avatar. You can choose from ten different races, however, there is no class distinction. Along with the progress in the game, your character becomes more and more powerful. Once you advance to a new level, you can increase one of the three basic statistics: magic, endurance, or health. The authors of the game completely rebuilt the skills system - these have been divided into distinct groups, such as one-handed or two-handed weapons. Each of these categories holds specific abilities and attacks. Changes were also made to magic - spells from Mysticism school were moved to other groups. There is a new combat system in Skyrim, which is more dynamic and at the same time requires tactical thinking. You can now assign a weapon, shield, or spell to each of the hero’s hands. In this way, you create many combinations, for example, an offensive spell in one hand and a sword in the other. The very clashes do not boil down to mindless mashing the keys, but it is necessary to properly move your hero, avoiding or blocking strikes and knocking opponents down. The hero can easily lose balance and get exposed to attacks from enemies, who are now much more vital and dangerous. Your character is also able to perform spectacular finishing blows. Another installment of The Elder Scrolls series again tries to recreate the impression of exploring a breathing world, populated by living inhabitants. Player’s decisions have now more serious consequences connected with more interesting behavior of other characters. When, for example, you drop a dagger in the center of the city, someone may bring it back to you, or quite on the contrary – steal it. Changes were also made to dialogues, which became much more natural. When you get bored with saving the world, you can relax by engaging in every-day activities. In The Elder Scrolls V: Skyrim you can gather crops, forge weapons, cook, extract raw materials in mines, and even create an armor. The Elder Scrolls V: Skyrim offers a chance to explore a huge virtual world, where you can find, among others, five major cities and hundreds of dungeons. In order to make it easier to move across such a large area the authors introduced an option of fast travel between locations. Again, enemy level scaling system was used, but this time the developers made sure that it would not be so intrusive as in Oblivion. The improved mechanics assigns you missions based on your past achievements and strengths of your character. For example, when a woman asks you to find her kidnapped daughter, the system analyzes which dungeons you have already visited and then puts the girl somewhere you have not yet been, while adding there opponents that may pose a challenge for your hero. The game uses an improved graphics engine known from The Elder Scrolls IV: Oblivion. The appearance of characters and their facial expressions and gestures were significantly improved, and dynamic weather effects (including snow) and wind simulation, which now realistically moves tree branches, were added. The game offers an option to disable all UI elements from the screen, thus allowing for a deeper immersion in the virtual world. This guide contains a thorough walkthrough for all the main and side quests in The Elder Scrolls V: Skyrim and detailed maps of all available locations.